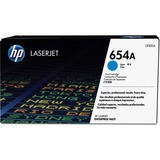 HP 654 LaserJet printing supply produces standout business documents with glossy, photo-quality color. HP ColorSphere technology delivers consistent, professional color. Avoid wasted time and supplies with reliable original HP toner cartridges. It is ideal for enterprise workgroups with managed printing environments, and small and medium-size businesses that carry out in-house marketing.